Some of my favorite things and events that I have enjoyed in the Fairfield County area. 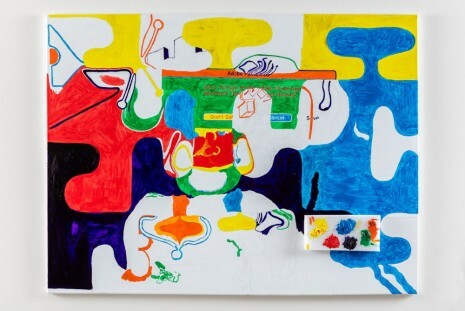 The Brant Foundation's upcoming exhibition features work by Joe Bradley, Oscar Tuazon, and Michael Williams. Sign up for one of our docent-led tours! Luncheon on the grass: On select Fridays, bring a lunch and enjoy a picnic on the Foundation's lawn after your tour. The lobster had been through Reagan and Koch, Clinton and the other guy; made one enemy, that sparrow; seen it all; loved painting. The lobster hung at William Copley’s gallery on Broadway. He was an adjunct at SVA, wrote at night with JMB; kissed Haring, met Pensato at the studio school, talked Manet with Eisenman. Matt Groening said “Beefheart begat Bart,” and the lobster could see it. Visited Providence for Joe, introduced Chris Martin to glitter, Angel Blood at Santos, TV when possible, on a rug from Bernhardt. “Pop,” as a category, was a reaction, to a changing economy and the creation of an industrial entertainment culture. Mass fantasy became an escape, an identity, then a commodity and finally a language. This history is as material as iron itself, a product of many rooted relations. As Thornton Dial shredded once-valuable metal to make a flag, Alex Bag shredded the nature documentary to make a feminist declaration of war. If Peter Saul used Mad magazine to depict our manic empire, and Denzil Forrester used Cézanne to capture a particular scene’s tumult, so Henry Taylor’s paintings of his friends speak in cartoon. It’s not popular, it’s unconscious. Nina Chanel Abney, Rita Ackermann, Alex Bag, Jean-Michel Basquiat, Katherine Bernhardt, Lizzi Bougatsos, Joe Bradley, Sarah Braman, Bread and Puppet Theater, William N. Copley, Thornton Dial, Nicole Eisenman, Denzil Forrester, Jason Fox, Keith Haring, Wally Hedrick, Lonnie Holley, Sadie Laska, Chris Martin, Jeanette Mundt, Laura Owens, Joyce Pensato, Carol Rama, Tyson Reeder, Peter Saul, Bill Saylor, Kenny Scharf, Josh Smith, Agathe Snow, Spencer Sweeney, Henry Taylor, Don Van Vliet and Sue Williams. The Brant Foundation Art Study Center has a mission to promote education and appreciation of contemporary art and design, by making works available to institutions and individuals for scholarly study and examination. The Brant Foundation Art Study Center presents long-term exhibitions curated primarily from the collection. The collection is remarkable in that scores of artists are represented in depth, including works from the earliest period of their practice through their most recent works. Currently, The Brant Foundation, Inc., established in 1996, lends works to more than a dozen exhibitions per year. The Brant Foundation Art Study Center is located at 941 North Street, Greenwich, Connecticut, and is open Monday through Friday by appointment only. Join in the conversation with The Brant Foundation and Animal Farm on Instagram via @TheBrantFoundation and the hashtag #AnimalFarm. It’s hard to believe that 40 years ago, Selma and Noel decided to open a vegan/vegetarian restaurant and feminist bookstore on an impossible to find dead-end street in Bridgeport, CT. The year was 1977 - before GPS existed. We opened with no trained chefs, no wait staff and delicious food, a plan that suited the lesbian feminist owners! It is 40 years later and we are planning a BIG celebration. To accommodate more people, we will hold celebration dinners over three nights Tuesday March 21st, Wednesday March 22nd & Thursday March 23rd. Similar to past anniversary dinners, we will be serving free champagne and holding a raffle. But in contrast, we ask you to make reservations to ensure everyone’s comfort. But we have many other celebratory plans for March and April! As part of our festivities, we want to draw attention to the other vegetarian only restaurants in CT. So we invited all of them! We are so pleased that the following restaurants wanted to participate and will be bringing some of their specialties and menus*. These are free events, but please make a reservation so we can know how many to expect. We will provide free coffee, tea and prosecco. Sunday March 5th - 4pm: Renana from It’s Only Natural in Middletown. March 7 - 19: Noel & Selma are ardent weavers and have asked members of the Hand Weavers Guild of CT to curate a weaving show from March 7 - 19th. March 28 - April 9: Caroly Van Duyn will bring new sculptures which will be for sale PLUS you can meet the artist the evening of March 29th! April 11 - 16: From our private collection, we will be displaying Myriam Fougere’s sculpture and ceramics. April 18 - 23: Also from our private collection, we will feature Australian artist Suzanne Bellamy's sculpture. On Sunday March 26th at 4 pm, we look forward to hosting a conversation with Sheila Jeffreys, the renowned Australian feminist author of "The Spinster and Her Enemies", “Anticlimax", “Lesbian Heresy” and Beauty and Misogyny”. We hope you will make reservations to meet her. Over the course of the 2 month celebration, there will be an extra reason to come visit us for Sunday Brunch - we will be holding a used book sale - just a penny per book! April 30th: Selma and Noel will host a cooking class titled "You ask for it” where they will show how to cook what you want to learn! Choose from vegan pie crust, mushroom walnut pate, simple vegan cheeses, chocolate cake or what? It’s your choice! Plus more surprises to be announced! To make reservations for any of these events, call Bloodroot at 203-576-9168. If you get our answering machine, leave a message and we’ll call you back to confirm! * Unfortunately G-Zen in Branford, Phali Too in New Haven, The Sweet Beet in Granby, The Stand Juice Company in Norwalk, Pure Alchemy Juice Bar in Wallingford and Lion’s Den Vegetarian in Hartford couldn’t make it, but we wanted to recognize their contribution to vegetarianism in CT.
Searching for a meeting space for your next business event? Need a conference room for your club or association gathering? Host your group for free in our store education center, and treat your guests to a complimentary wine tasting (where available). Our flexible meeting space can accommodate groups large and small. Our meeting space is a venue for events as varied as the wines, beers and spirits we have on our shelves. We’ve hosted board retreats, non-profit outreach sessions, PTA assemblies, professional association seminars and shareholder meetings. All meetings must be booked three weeks in advance, and may be held one hour after the store opens up to two hours before the store closes. Booking hours vary by location. Meetings may be booked for Monday, Tuesday or Wednesday. All classrooms are closed on days surrounding and including major holidays. Total Wine & More provides public Wi-Fi access in all of its locations. Please note that Total Wine is not responsible if the system is down or has a slow processing speed during your meeting. You will need to bring your own laptop to hook up to the projector. There is no computer available for customer use. Users may bring food or catering (where allowed by law), but we’ll need you to clean up after yourselves. Though cheese, crackers and bread are provided (where allowed by law) with our paid private class packages, we do not offer any catering services. All wine available in the room must be poured by a Total Wine & More team member in tasting portions associated with a complimentary or paid wine tasting. Under no circumstances will spirits be offered or poured. Total Wine & More reserves the right to accept or decline a request at any time for any reason. The use of the classroom is free and limited to availability. Access and use of the room is limited to the reserved time only. A minimum of three weeks lead is required for any reservation. A maximum of two meetings is permitted in a single location. Bookings at multiple locations and dates are permitted. Total Wine & More will not allow minors under 21 in the classroom, even when accompanied by a parent or guardian. Total Wine & More does not allow the use of the classroom for personal or business profit; this includes any charge for guests to attend the meeting or sales where money is exchanged for products or services. Classroom seated capacity varies by store. Attendees must not exceed the listed capacity of the room. Attendees that do not have a seat will be turned away.Classes are supervised and wines are poured by a Total Wine & More Team Member. Under no circumstances is self-pouring permitted. Tasting amounts vary by state law and will not exceed 2 oz. Food of any type can be brought into the room, but no beverages other than coffee may be brought in. Discounted water and soft drinks are available for purchase at the store. Supplies such as table cloths, plates, forks, etc. are not provided. Total Wine & More does not permit the use of their computers. We are not responsible for troubles with the speed of the Wi-Fi or system failure during your presentation. Blackout periods apply (two days prior to a major holiday, the weekend of a major holiday and during the last six weeks of the year). One 30-minute complimentary wine tasting is offered for groups of 14 or more seated guests gathered for a meeting or group activity. We only offer wine for complimentary tastings. The purchase of alcohol for the purposes of consumption or tasting while in the classroom is not permitted. Room cleanup after the meeting is the responsibility of the group organizer. Total Wine & More does not permit the tasting of more than eight types of wine within a two-hour timeframe. We do not offer or pour spirits for classes. Total Wine & More can provide a selection of cheeses, bread and crackers as well as water with private classes. Catering and other outside food is also permitted. I have been a member of Work It Dance & Fitness and have tried all of their classes. My personal favorites are Tone & Tighten, Stretch and Belly Dance. This weekend at the SoNo Arts Fest the students will be showcasing what they have learned. It should be a great show. So come Saturday or Sunday 1 p.m. Here's a few performances from last year. Last night we flew to Rio and danced the samba without ever leaving Westport. If you stayed home and watched reruns you missed a wonderful night. I have always loved Brazilian music which has its roots from deep in Africa. Arthur Lipner put on a great show with a full band. At the end everyone followed the samba drum parade to rear of the pavilion. These free, led sessions give us an opportunity to practice and discuss as a group. Friday the 13th, a most auspicious day, was also the eve for Neu Nights at the Neuberger Museum at Purchase College. Now the Neuberger is a great place to visit even on an average Saturday afternoon. It has a great permanent contemporary art collection, African art, and revolving exhibits (last night had the art of Kuba from Central Africa which inspired Klimt apparently as well as dust bowl like photos by Mike Disfarmer). Last night, however, was also a Neu Night. What's that? Well it's the convergence of great art, a ripping DJ from WFUV (last night was Rita Houston and Alisa Ali), mouth watering cheeses(pics below), veggies and passed hors d'oeuvres by Andy Burke(my favorite were the Vietnamese spring rolls), cocktails (last night I tried a Black Cat) and big dance party(see video). Andy Burke is the "house" caterer but he also did my kids' bar mitzvahs and many other events. He is creative and down to earth--love, love his food. I always run into friends from the area and we all had a rip roaring time dancing with the crowd which included 20-80 year olds. Last night was especially frugal as I was able to bring a friend in (usually $20) because of my WFUV membership, entered to win tix to a show at the Capitol and received a year membership to the Neuberger. Now that's value. On the afternoon of February 8, 2015 at the New Canaan Library an Australian multi-instrumentalist, Adrian Cunningham, brought us the music of Louis Armstrong, Fats Domino, Sidney Bechet and mixed it all together with a little jambalaya from New Orleans. He had us singing spirituals, swinging scarves and umbrellas in our seats and having a grand ole time without leaving the county. Not to be missed are the music series in Wilton and New Canaan--held at the libraries. It's free (donation) and features top notch performers from all over. Please send your comments/suggestions my way...Thank you!